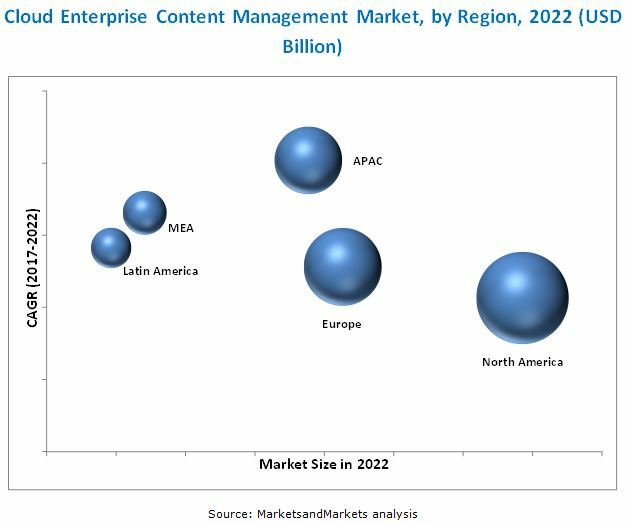 [136 Pages Report] The cloud Enterprise Content Management (ECM) market size is projected to grow from USD 9.77 Billion in 2017 to USD 34.42 Billion by 2022, at a Compound Annual Growth Rate (CAGR) of 28.6%. Factors such as growth in the digital content across enterprises, easier access from remote end-points, and need for regulatory compliances are fueling the growth of the cloud ECM market, across the globe. The base year considered for this study is 2016 and the forecast period considered is 2017–2022. The cloud ECM ecosystem comprises service providers, such as OpenText Corporation (Ontario, Canada), Newgen Software, Inc. (McLean, Virginia), Xerox Corporation (Connecticut, US), Hyland Software, Inc. (Ohio, US), Microsoft Corporation (Washington, US), M-Files Corporation ( Dallas, US), Oracle Corporation (California, US), IBM Corporation (New York, US), Everteam (Paris, France), Box, Inc. (California, US), Alfresco Software, Inc. (California, US), and Docuware GmbH (Germering, Germany). Other stakeholders of the cloud ECM market include ECM vendors, cloud brokers, and managed service providers. Cloud ECM is a set of defined processes to securely procure, store, monitor, and manage enterprise data to deliver crucial information by moving paper documents and electronic files into an organized electronic format. It is a Software as a Service (SaaS) based approach designed for organizations to eradicate ad hoc processes that can lay open an organization to regulatory compliance risks. 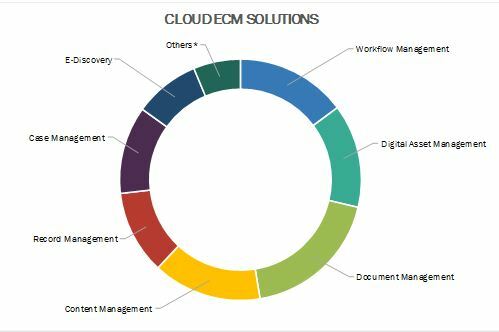 Cloud ECM includes features such as document management, content management, workflow management, and record management. Cloud ECM serves the needs of geographically dispersed business units by providing one consolidated solution. In order to leverage the full benefits of this technology, organizations are shifting from on-premises ECM solutions to cloud. 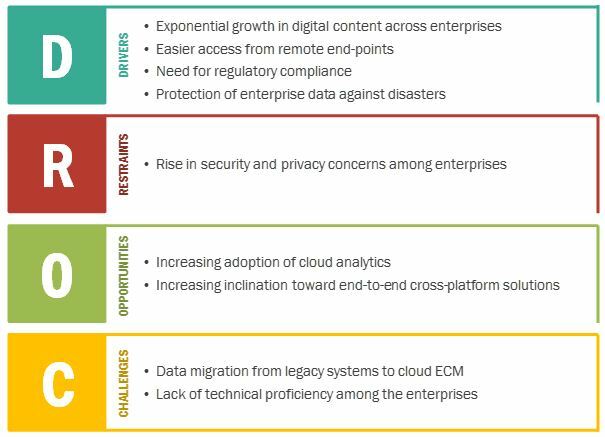 The major factors that have been driving the adoption of cloud ECM are the exponential growth of digital content across all types of enterprises, easier access from remote end-points, need for regulatory compliance, and protection of enterprise data against disaster. However, the risks associated with data security and privacy of enterprise’s data is hindering the growth of the cloud ECM market globally. Moreover, increasing adoption of cloud analytics and growing inclination toward data integration are some of the factors driving the market, while the lack of technical proficiency among enterprises and intense competition among vendors are the challenges faced by the vendors in this market. OpenText acquiring Dell EMC’s Enterprise Content Division, Documentum and Hyland completed acquisition of the Perceptive business unit which was part of the enterprise content management business unit of Lexmark International that Hyland acquired in 2016 were some of the major acquisitions in the ECM market. Enterprises need solutions that fit snugly with their current systems, to not overhaul technologies that are already in place and working well. A truly comprehensive solution offers a suite of integration capabilities that enable enterprises to collaborate data to help staff makes informed decisions. However, the demand for single-source and cross-platform solutions is on the rise. The cloud Enterprise Content Management (ECM) market size is expected to grow from USD 9.77 Billion in 2017 to USD 34.42 Billion by 2022, at a Compound Annual Growth Rate (CAGR) of 28.6%. The major drivers of this cloud ECM market include the growth in the digital content across enterprises, easier access from remote end-points, need for protection of enterprise data against the disaster, and need for regulatory compliances. The cloud ECM market report has been broadly classified on the basis of solutions into document management, content management, case management, workflow management, record management, digital asset management, eDiscovery, and others; on the basis of services into professional services, and managed services; on the basis of deployment models into public, private, and hybrid; on the basis of organization sizes into Small and Medium Enterprises (SMEs) and large enterprises; on the basis of verticals into BFSI, education, energy and power, government and public sector, healthcare and life sciences, manufacturing, media and entertainment, retail and consumer goods, telecommunications and ITES, and others; and on the basis of regions into North America, Europe, Asia Pacific (APAC), Middle East and Africa (MEA), and Latin America. The document management solution is projected to hold the largest market size and is expected to continue its dominance during the forecast period. There has been a tremendous increase in the volume of documents generated in an enterprise on a daily basis; thus, this increases the need to manage and store the generated data. Moreover, the need to maintain metadata files is increasing due to tremendous rise in organizational content, generated on a daily basis. Metadata files can be instrumental in defining the control and access mechanism of the documents. The public deployment model is projected to hold the largest market share in 2017 and is expected to grow during the forecast period. The main reason for the high adoption of public cloud is its ease to access and fast deployment. The public cloud deployment model offers various benefits to the enterprises, such as scalability, reliability, flexibility, and remote location access. The public cloud deployment model is more preferred by the enterprises that have less regulatory hurdles and are willing to outsource their storage facilities either fully or partially. The major concern with public cloud is its data security due to which, many enterprises are shifting to private and hybrid cloud storage solutions. The SMEs segment is moving toward the adoption of cloud ECM and growing rapidly at the highest CAGR during the forecast period. Cloud ECM has become a crucial part of the business processes in SMEs, due to the ease of use and the flexibility it offers and is expected to grow in the coming years. APAC is expected to be growing at a higher rate in the near future. The increased need to manage consistent data and prompt control and visibility mechanisms has led to a wider demand among enterprises for ECM solutions in the APAC region. Moreover, the sale of ECM solutions is increased due to the rising need for implementing security and accessibility controls; enhanced decision-making has led the APAC region to become a highly potential market. Growing concerns regarding security and privacy are some of the major restraints and challenges in the cloud ECM market. Some of the key vendors in the cloud Enterprise Content Management market are OpenText Corporation (Ontario, Canada), Newgen Software( New Delhi, India), Xerox Corporation(Connecticut, US), Hyland Software, Inc.(Ohio, US), M-Files Corporation(Texas, US), IBM Corporation (New York, US), Oracle Corporation (California, US), Everteam (Paris, France), Box, Inc.(California, US), Alfresco Software (California, US), Microsoft Corporation (Washington, US), and DocuWare (Germering, Germany). These players have adopted various strategies, such as new product developments, acquisitions, and partnerships to serve the cloud ECM market. Continuous technology innovation is an area of focus for these players to maintain its competitive position in the market and promote customer satisfaction. The cloud ECM market is expected to grow significantly with the increasing need for regulatory compliance to address industry standards and regulations across all regions. The exponential growth in digital content across enterprises is one of the major drivers of this market. Enterprises are deploying cloud ECM as it eases the accessibility of enterprise data for employees working at remote locations. The cloud ECM market is diversified and competitive with many market players, such as Oracle, Microsoft, OpenText, and Hyland. There has been a tremendous increase in the volume of documents generated in an enterprise on a daily basis; thus, this increases the need to manage and store the generated data. Microscopic analysis of the organizational content is necessary to establish relationships between heterogeneous variables and accordingly, frame organizational strategies. Moreover, the need to maintain metadata files is increasing due to the tremendous rise in organizational content. Metadata files can be instrumental in defining control and access mechanism of the documents. The content management solution comprises web content management, social content management, and mobile content management. The web content management is a set of tools that enables an enterprise with a way to manage digital information on a website through creating and maintaining content. Social content management solution helps to manage, publish, and monitor the workflow of multiple social media channel from a single tool. Mobile content management solutions provide capabilities to store and secure content. It also provides services to devices, such as smartphones, tablets, and PDAs. The content generated in enterprises can be used to streamline organization’s business processes and reduce the overall cost of ownership. The increase in the eCommerce applications on a global scale has led to an increase in awareness, regarding the need to avail right data at the right time along with content management to achieve sustainable development. Social media is considered as one of the most effective platforms for the enterprises to create new leads and get more traffic. Social content management is one of the types of content management that helps enterprises to successfully implement product campaigns over various social networking sites such as Facebook, LinkedIn, Twitter, and Google+. Mobile content management enables enterprises to store data on a centralized server in a raw format, which is later delivered to various types of mobile devices in a format they are compatible with. The solution enables employees to simply reach for their smartphones and tablets to share, review, approve, write, read, edit, present, and perform countless other work-oriented activities in seconds. Case management can be defined as the technique of processing a business case. A case here refers to a collection of files, digital documents, and business workflow activities by knowledge workers or case workers. A case can be defined as a business entity that an organization possesses and that needs to be processed. Advanced case management is a process to manage, update, monitor, interpret, and understand every bit of a business work as it is processed. There has been an increasing demand for tools, which supports content workflow management, specifically for website data management. Additionally, with growing use of Internet, mobile devices, and social media among customers, the demand for content workflow management has grown exponentially. Moreover, the time spent by users online has increased tremendously, and websites have become a major way to connect with the enterprise business and other prospective customers. Websites also provide a platform to promote enterprise products and furthermore boost their marketing strategy. Records management is essential as most of the enterprises are hampered due to the mismanagement of records such as missing values, non-conformance to business semantics, repetitive records, and incorrect entries. Therefore, to ensure business continuity, it is necessary to put in place a proper records management framework. Every enterprise business, government agencies, and other sectors such as BFSI, telecommunication, and healthcare, need record-keeping for various purposes. Records management is a cyclical process which enables continuous analysis, observation, and enhancement of enterprise records. Digital asset management creates a centralized storage for digital files and programs to archive, retrieve, and search the digital content. Digital asset management systems provide a centralized repository for archiving, integrating, managing, and accessing digital assets: both the documents and the related metadata. Digital assets consist of images, graphics, logos, animations, audio/video clips, presentations, web pages, documents, and a number of other digital file formats. Digital asset management is considered significant in terms of managing the asset lifecycle of an enterprise. Electronic Discovery (eDiscovery) can be defined as the process in which identification, collection, and production of Electronically Stored Information (ESI) is performed for a particular civil litigation or investigation. ESI can be documents, emails, databases, voicemails, presentations, audio and video files, websites, and social media. The eDiscovery solutions mainly comprise prominent solutions for legal hold (legal hold prevents addition, modification, and deletion of data), early case assessment, data processing, and data production. The other solutions include enterprise portal management, enterprise archive solution, and enterprise performance management, which simplify content management across varied platforms to enhance business decisions and resolve business complexities in a quick manner. Enterprise portal management is a process of integration and aggregation of the information, processes, and people across the enterprises. It can be used in monitoring and managing crucial website content and can also provide transparency, control, and visibility in website content management. What are the latest innovations happening in the cloud ECM market? What are different use cases of the cloud ECM solutions? Various strategies adopted by the leading vendors in the market? What should be your go-to-market strategy to expand the reach into developing countries across APAC, MEA, and Latin America? *Details on Business Overview, Strength of Product Portfolio, Business Strategy Excellence, Recent Developments Might Not Be Captured in Case of Unlisted Companies.